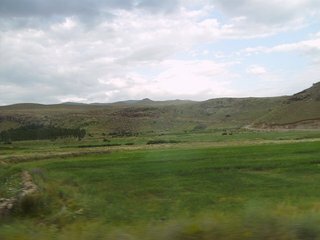 13-Jul-2007 -- A holiday to eastern Turkey to climb Mount Ararat gave me the opportunity to at least think about visiting 39N 44E. Nestled in the north-eastern corner of Turkey close to the borders of Armenia (North), Iran (East), and referred to by the locals as Kurdistan, this part of the world would seldom be visited if it wasn't for Mount Ararat. In fact during our week-long sojourn there we only met one non-climbing group. We did not know the military situation in the area (it is east towards the Iranian border and possibly Kurdish separatist country). Although there are roads marked on the MapQuest map, the condition of these roads was not known. Driving down the D975, near the towns of Gönderme/Gümüştepe, I started measuring the distance to the CP and looking for suitable roads that might take us there. To cut a long story short, the closest distance I got was 16.3 km and I saw only one potential dirt road that could take us in the right direction (see photos). The problem being that towards the East there is a mountain range blocking the way. Not high, but enough of a barrier. There are routes through for sure, but with the poor roads and even worse signposts (i.e practically none), it might take some exploration to find the way. Sadly for us, it was not possible. This was not the closest CP I got to, this being 41N 29E in the Bosphorus/Istanbul between the European and Asian land masses. I didn't realize this during my visit there, so failed to make any attempt to visit this point. Next time maybe.